In a little hut on Mystery Island you are able to visit the Island Mystic to have your fortune read to you. Will the fortune actually be helpful to anything in your life? That is up in the air, but it is a fun little tourist trap! It is unknown if his fortunes are meant to be taken literally or if they have a much deeper meaning, he has been known to spout off things about fighting invisible Zafars. Any player who has played a game of Cheat! has probably lost to Capara at some point or another. She gave up a life of shopkeeping to wheel and deal with the big boys at the infamous card game. Jazan rules over the Lost Desert area known as Qasala. Perhaps you've been over there attempting to win some free NC from the Expellibox. Jazan has been through the ringer, he's been tricked and deceived many times and that put his whole kingdom at risk. There was a curse that was running through Qasala, turning people into undead warriors, and it was thought that Jazan could break this curse by marrying Princess Amira. After the marriage it was discovered that this idea was false and was created to trick Jazan into releasing his father, a very evil man that was attempting to destroy Qasala. He was able to overcome his father and eventually break the curse over Qasala. A wide Tyrannian who resides as the Grand Elder of the Council of Elders, Kyruggi also leads the village of Tyrammet. She also seems to be a big fan of the game Go! Go! Go! You may be able to tell by now that Kyrii are excellent game players and excel in the card games or anything that requires devious work. It is very apparent when you look at all the prominent Kyrii around Neopia that they enjoy traveling and have carved out a home for themselves in every corner of the world. They generally enjoy traveling in packs but also know how to make their way solo if necessary. While they are able to adapt to new environments well, they do not like to do so without a bit of grooming. For a lack of a better word, Kyrii can be divas. They require constant maintenence to keep their fur clean, only using the best soap and shampoo products that money can buy, things that would make the Air Faerie jealous! They typically have a great smell about them thanks to their perfumes and products, and they keep a host of different brushes and comes available for all of their fur. When customization came on the scene, Kyrii everywhere were obsessed. They love to dress up, mix and match styles, and really take it to the extreme. They are one of the greatest species to customize and have a large amount of really cool clothing available. Just make sure you keep those outfits clean for them!! While they are divas and known to be picky, Kyrii are not exaggerating their hatred of apples. It goes beyond not liking the taste, they are actually very allergic to them! Feeding your Kyrii an apple will cover their body with itchy scratchies and they won't find relief until you get some healing ointment or take a trip to the Healing Springs. Even the thought of going Apple Bobbing will make the strongest Kyrii shutter. While they can't eat apples, they are a fan of oranges! In fact, Capara used to be an orange seller before she gave up shopkeeping for a life of Cheat. Although, the oranges she was selling were extremely rotten...it's thought she was keeping the fresh ones to herself. It is unclear to me however if an Imposter Apple will make a Kyrii sick, the placebo might be enough to make them itch. Do you feel like you know a bit more about Kyrii now? Yes, they are devious and sneaky, a bit of a diva, but they aren't malicious in any way. They will scam you for a few neopoints, or mislead you with a weird fortune, but as we see with Jazan and Kyruggi they can be very helpful and kind. 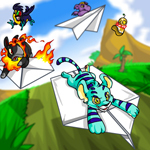 They are a very particular pet who need things to be just right, super clean and everything in its place, but they are a lot of fun and always love a good game. If you are looking for a super stylish pet that is easy to customize and always down to have fun, these guys make a good choice. You can travel the world together, exploring the deepest depths of Terror Mountain or the farthest reaches of the Lost Desert, or spend a rainy night at home playing card games and telling stories. And if you come across a pack of them in the wild they are going to have tons and tons of interesting tales to share. Kyrii are not a limited edition pet and thus can be created any time, not just on their special day, but consider checking the pound for them. Since they are so easily created there are a lot out there, and a lot end up in the pound. Look around and try to find a Kyrii that you can bond with in the pound, those guys really need a home and it gets lonely in there. Adopting a Kyrii will bring you endless joy and it will be a friend for life, as long as you remember to give them the best shampoos you can find! !